Nominated for Best Song (“Everybody Needs a Best Friend,” Seth MacFarlane, Walter Murphy). Guys, I am going to be completely honest. I was dreading this movie. It is one of the last films on my list to watch from the 85th Academy Awards. Let’s just say that Seth MacFarlane and I do not see eye to eye on what constitutes “humor.” By the end of the film, I wasn’t hating my life, although I felt like I had just wasted a little of it. Let’s stop dwelling, though, and jump into the review. The film starts brilliantly like an old classic Christmas film, complete with snow and a deep voiced narrator, although he tends to swear. The neighborhood kids all hate John Bennett, even the bullied Jewish kid. Everything changes when John receives a giant teddy bear on Christmas morning. That night, he wishes that his bear was alive and that they would be best friends forever. When morning dawns, he discovers a walking, talking bear named Ted who wants nothing more than to be BFFs. Once John’s parents get over their shock a little, Ted becomes a national sensation, appearing all over the news and becoming famous. But, as the film explains, just like everything that becomes famous, Ted is eventually old news, and just like that, Seth MacFarlane and his team made the situation–an alive teddy bear being an accepted member of society–believable. We come back into their lives several years later. John (Mark Wahlberg) is 35, has a fruitless job at a rental car agency, smokes weed whenever he can, and has been dating his ridiculously gorgeous girlfriend Lori (Mila Kunis) for four years without a proposal in sight. Ted (Seth MacFarlane) lives with them and frequently brings home hookers or has outrageous parties. Lori is losing her patience, and it seems like Ted is at the root of their relationship woes. After all, will a guy ever grow up if his best friend is a teddy bear? 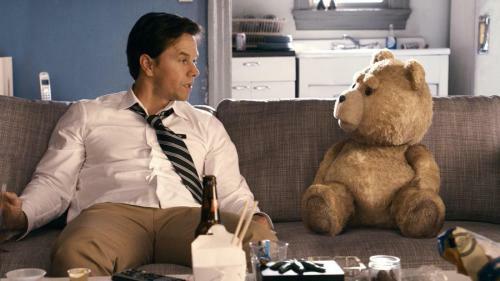 Perhaps it is because Ted is a toy, but his humor is the most inappropriate and outrageous out of anyone in the film. This cruel irony supposedly makes it even more fun but again, it isn’t my cup of tea and actually makes me dislike the film more. The characters were all right. Watching a grown man child learn to adult (yes, it is a verb) isn’t usually this painful, but John takes an outrageously long time to figure it out. Lori gives him a lot of leash after dating him for four years, but perhaps that’s because her other prospect is her sleazy, arrogant boss. One thing is for sure, though–anyone who makes a walking, talking teddy bear a believable character in an every-man type of film deserves some credit. I have had friends rave about this film. Some people think it is the funniest thing they have ever seen. I will say that it is outrageous, and yet its level of believability is astounding. The acting is so-so, the humor oddly timed and inappropriate at best, and its story line is, for the most part, predictable. I don’t even remember the song it was nominated for. The believability is the one and only reason I gave this film two stars instead of one. In reality, this film doesn’t truly stand up to semi-recent classics such as Knocked Up and 21 Jump Street. It is crass, uncultured, unartistic, and really just a waste of my time. However, if you like MacFarlane and Family Guy, Ted might be something you need to add to your watch list. Nominated for Best Live Action Short Film (Esteban Crespo). Aquel No Era Yo is hard to watch from start to finish. While its execution and possible story can come off as slightly melodramatic, it turned out to be pretty powerful for me personally. There is one negative that I found in the film, and that is its use of non-linear story telling. It gives something huge away, which takes away from the suspense and therefore the power of the story telling. 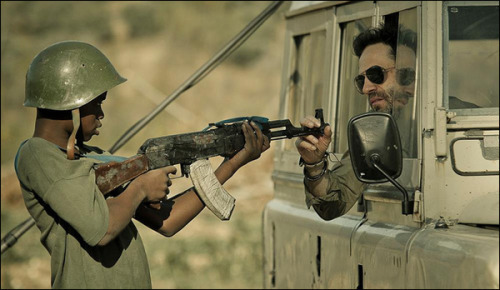 Occasionally throughout the short we see a glimpse into the future, into a classroom where first world students are learning about child soldiers and the war culture in this particular African country. Immediately we know that people survive, and that impacts the plot in a very negative way. Despite this, the rest of the filming is very well done, from cinematography to acting, color grading to sound and the development of character, Aquel No Era Yo was definitely a force to be reckoned with at these Oscars. Despite their loss, the film was very deserving of its nomination. If you can find the time to see the powerful and well made film, I would recommend it! Just be aware that it is very intense and doesn’t pull any punches. Nominated for 1 award, which it won. Won Best Live Action Short Subject (Shawn Christensen). I adored this short film. In my opinion, it is everything that a short film should be. There is symbolism, experimental and artistic cinematography, strong story telling, solid acting, and a cohesive whole that definitely deserved to win the Oscar for Best Live Action Short Subject in 2013. Richie (Shawn Christensen) is in his bathtub, clearly in the middle of committing suicide by razor blade, when his phone rings. It is Maggie (Kim Allen), and apparently Richie is the last person she would ever call but she needs his help. Richie gives in, cleans himself up a little, and heads out to meet his niece whom he hasn’t seen in years. Sophia (Fatima Ptacek) is a force to be reckoned with, just like her mother. 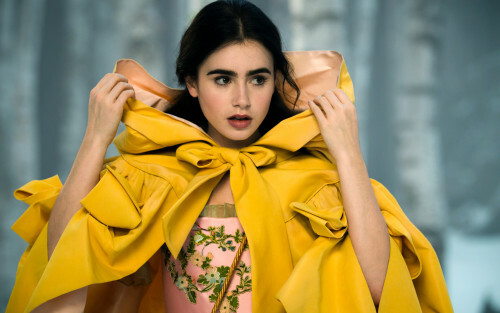 Strong, and independent, she knows how to stick up for herself, which may be because she grew up in New York, or maybe it’s because of her mother’s example. She thinks very little of her Uncle Richie who supposedly messed up really badly when she was little and has been cut out of their lives since. He is a mess. He has huge circles under his eyes, his wrists are bandaged, and a cigarette hangs from his mouth. He takes Sophia to the only approved place (the bowling alley), where things get a little weird and people start dancing, but it actually works incredibly well with the story line and character arc. It is night time in new york, therefore the lighting stays pretty dark, but the filmmakers use a strong contrast that works well for the film. He forms a tentative relationship with Sophia who is slow to let down her guard, but she seems to get the measure of him pretty quickly (which is good since this is a short film). The short uses the landscape of New York City nightlife very well. It follows the growth of their one-night relationship and makes you root for everyone, even the mom. 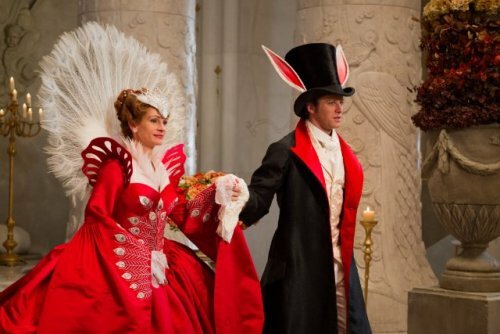 Christensen wrote, directed, and acted in the piece, which surprisingly works out pretty well for him. 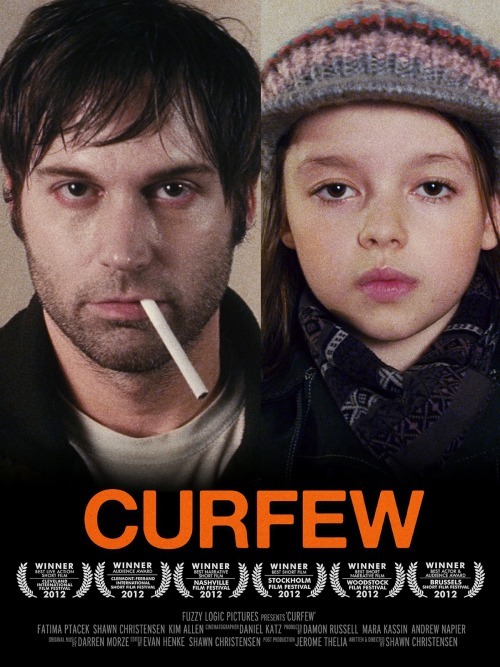 Honestly, Curfew is the type of piece I would have adored in my intellectual, artistic filmmaker university days, but at a level that the more consumeristic side of myself can enjoy just as much. It is a great film. If you have twenty minutes, or even if you don’t, this is a short I would definitely recommend that you watch. If you have never really sat down just to watch a short film, I would suggest that you start here. It is that good. Nominated for Best Documentary Short Subject (Jon Alpert, Matthew O’Neill). Redemption is a unique view of life in New York. 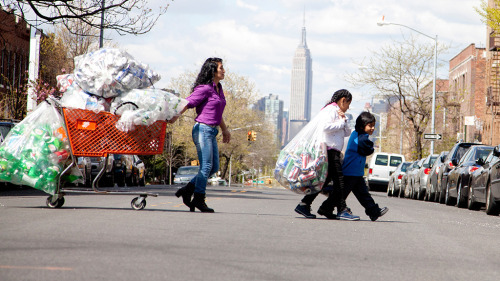 On the very doorstep of nice homes and large buildings, condominiums and the Empire State Building itself, the impoverished of the city spend endless hours, day in and day out, collecting bottles and cans from trashcans in order to redeem them for five cents a piece. This documentary short follows a basic premise to tell a sad story. It follows different people, from veterans and the elderly, to immigrants and single mothers. Some of them live on the streets and band together from a mutual need of safety. Others live in a one room apartment with at least six other people. Some New Yorkers help the collectors, while others turn a blind eye. The one bedroom apartment is like a scene from hoarders. It makes the situation more real and brings the message of the film home. It doesn’t matter where you come from. There is a woman who worked for Microsoft for years, but now her Social Security benefits don’t cover everything and she has to can all day, fighting with an angry and overly competitive Chinese woman who will steal your cans right from under you. Each person has a story. The film is very transparent. It doesn’t seek to hide its message or motives under artistic camera work or in-studio interview footage. It is all on the streets. There is little to no symbolism. It is simple. This probably makes it more powerful, and yet from an artistic standpoint it is very blah and unimpressive. It transitions from character to character well, and it tells their stories even better, but there is nothing else to it. Perhaps its length limited it, but its rawness was a negative for me. The documentary is less than half an hour long. If the story sounds interesting to you, then I would definitely recommend it. I am a lover of documentaries and don’t consider my time wasted by viewing it. It did open my eyes a bit more to the poverty around us, which is probably the biggest goal of the film, and therefore it did its job. However, in my opinion, a film should exceed the bounds of just “doing its job” in order to deserve an Oscar nomination.